I live in Northern Texas and the summer can sizzle the running life right out of you. During the Summer months, I do not race and I do not run above 4 miles on any given run. However, I like to drink beer after races and the Oktoberfest races start to pop up around September and October which means I have to trudge through the heat to get my running legs back in shape. If you’re located in some area of the world where the temperatures don’t get above 80 degrees (26 Celsius) in the summertime, feel fortunate. These simple tricks don’t totally take the heat away but they do help relieve some pain when battling those hot summer days. If you have to run when the sun is out and you are running 6 plus miles, try to find a location that lets you loop back every 2 miles or more often. In some cases, you can just run laps in your neighborhood, although the scenery might get dull. What I do is run in a local park that I can park in the middle of two routes that extend two miles each way. I run two miles and it loops back to my car. In my car, I have an iced down cooler, such as a Yeti, filled with lots of goodies such as G2 Gatorade and water. I don’t have to wear a hydration pack (optional) because every two miles I get to stop at my makeshift water aid station (my car). After my run is over I walk back to my car can grab the Gatorade and cool down. You would be surprised at how many people look at your ice cold Gatorade and almost start drooling. For some of us that are strapped for time, this might not be an option. If you do have the luxury of commanding your own time then the best time to minimize the heat of the sun is to run before the sun comes up. 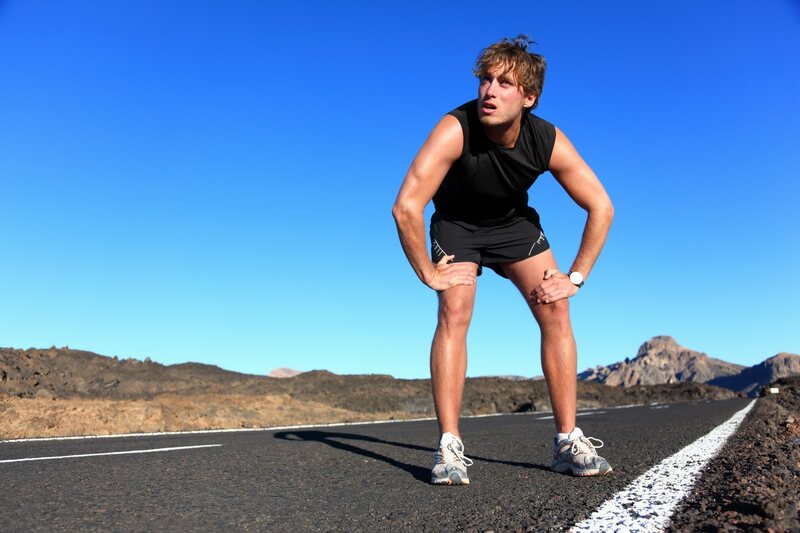 Ideal running temperatures for me are between 50 to 75 degrees Fahrenheit (10 – 24 degrees Celsius). For training purposes running when the temperature is warmer outside is good for conditioning, however, on race day you want to race when it’s much cooler for maximum performance. The more your body is sweating the more energy it is using to help cool your system down. This is an obvious answer to cooling your body down while you trudge through your long runs. However, if you’re like me, getting me to run past 4 miles on a treadmill is like trying to make me eat squash when I was a child. Not going to happen. Some runners have no problems running 10 plus miles on a treadmill. I wish I could do it. I have even tried to run on the newer models that have a scenic flat screen running route in front of you. Hydration gear lets you break free of having to run a specific route and make a pit stop to rehydrate. Just dump a liter or two of water into your pack and choose a direction. I run with a Camelbak Hydration Pack. There are many different types of other hydration packs that are less expensive. Camelbak tends to have superior duration. I purchased a Camelbak mule 10 years ago for snowboarding and the pack is still in great shape. Hydration belts are another great way to keep hydrated and not have to hold anything in your hand. This fastens around your waist and places the hydration bottles and pocket on the lower back portion of your body. Hydration belts offer a little more freedom versus the tightly strapped hydration pack. Hydration belts, however, can’t carry near as much liquid as a hydration pack. Handheld hydration packs are also popular with many runners. Just as the name implies you run with the water bottle attached to the hand. I personally cannot run long distances while holding something, if you can and you don’t need much water for hydration, then this pack might be for you. If you’re a male and don’t care about showing off your chest you can go shirtless. The females, on the other hand, don’t have that option. Tank tops are always a great alternative to shirts which allow more airflow when you run. Loose running shorts can also help keep you cooler on longer runs. Also, lighter socks can help prevent your feet from sweating as much. I wear nothing but Balega socks. Since I started wearing them almost 2 years ago, I stopped getting blisters on my feet and they stay cooler when I run. Headbands are another must for me. They help keep the sweat out of my eyes. Also, for females with long hair, a headband will help keep your hair back as well. When it’s really hot I will combine this entire list together and throw in some extras. As soon as I wake up I take the items out of the freezer. Place my frozen headbands in the portable cooler such as a Yeti. Put Gatorades or other sports drinks in the cooler. As mentioned above about the route, I choose a route that loops me back to my car every 1-2 miles. I throw on hydration pack and start logging the miles. Drink when your thirsty and when you get hot grab a frozen headband out of your cooler. It feels great on your skin! The semi-frozen hydration pack will also feel nice and cold against your back. Also, don’t forget to try to run earlier in the morning to help stay cool.